I felt invigorated upon leaving the HKTWH workshop. I felt the connection and realized that I have what I need to take that next step forward in my life… I just have to go for it. The workshop was fun and enlightening. Everyone from the staff to the participants were easy-going and inspiring. It was nice to be with a group of like-minded individuals who truly listened, supported and encouraged one another. It was nice to attend with my husband… who also realized a few things. He keeps telling me, “you know… I learned something this weekend. Thanks for doing what you do best. I like the fact that Brian is living his dream; practicing what he preaches. To truly see the joy in his heart while at work just makes you smile and know that yes… dreams can come true. 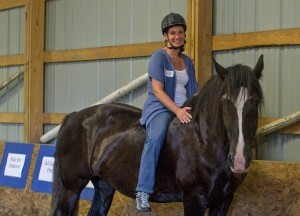 I would describe the workshop as fun and uplifting by giving inspiration through the connection with the horse. Witnessing firsthand the personal growth of attendees while feeling personal growth within one-self while learning the HKTWH’s core principals is healthy food for the soul. The transformations from the beginning to the end of the workshop are amazing. Thank you to all the HKTWH staff. We had a great time and we hope to see you all again soon.